Malaysian Palm Oil Council (MPOC), 2nd Floor Wisma Sawit, Lot 6, SS6 Jalan Perbandaran, 47301 Kelana Jaya, Selangor, Malaysia. Trans fatty acids (TFA) are produced when oils and fats containing unsaturated fatty acids are hydrogenated in the presence of a catalyst. Hydrogenation primarily increases the melting range of the unsaturated fats and thereby enables their incorporation into many solid fat formulations. When an unsaturated fat or oil is fully hydrogenated, all the unsaturated fatty acids are converted into their saturated analogues. Since unsaturation in most vegetable oils is largely 18-carbon fatty acids, namely oleic (18:1 n-9), linoleic (18:2 n-6) and linolenic (18:3 n-3), full hydrogenation of such oils would result in a steraic acid (18:0), high melting block of fat. Partial hydrogenation, in the presence of catalysts results in the formation of TFA. These are the geometrical isomers of unsaturated fatty acids containing at least one double bond in the trans configuration . This trans configuration imparts physical properties including reduced fluidity of the fat thereby increasing its melting point. Thus partial hydrogenation of liquid oils has been the tool of choice to enable their use in solid fat formulations. Partial hydrogenation actually results in both cis and trans fatty acids, occurring anywhere between carbon 4 and carbon 16 of the fatty acid molecule with elaidic as a major isomer and smaller amounts of numerous other trans isomers occurring concurrently. Upwards of 20 different cis and trans geometrical isomers have been recorded following partial hydrogenation of vegetable oils. Small amounts of TFA occur naturally in dairy fat (butter) and meat as a result of bio-hydrogenation in the fore stomach of ruminant animals. TFA are present in foods containing traditional stick margarine, bakery and frying fats, vegetable shortenings, and vanaspati. They are widely distributed in the foods we consume. Estimates of trans consumption are very varied and this has been hampered by a lack of an accurate database to reflect their contents in common foods . Since their introduction into the human diet and until the early 1990s, partially hydrogenated fats containing TFA were advocated as the preferred fatty acid base for solid fats, especially margarines. They were initially designed to replace butterfat and with advancements in our knowledge about the adverse impacts of saturated fatty acids (SFA) on cardiovascular disease (CVD) risk, TFA were made prominent as a safe alternative. Similar to other common fatty acids, TFA are efficiently absorbed in humans and completely catabolised to carbon dioxide and water. Variations in their geometrical configurations (relative to their cis fatty acids), melting behaviour and position of double bonds has no measurable effect on absorption efficiency. They are also incorporated into human adipose tissue and other organs just like cis fatty acids. The study of Mensink and Katan  suggested that trans increased total and low-density lipoprotein cholesterol (LDL-C) and decreased the beneficial high-density lipoprotein cholesterol (HDL-C) resulting in a less desirable TC/HDL-C ratio. Nearly a dozen other studies quickly fortified this finding, almost all reflecting increases in the atherogenic LDL-C and decreases in the beneficial HDL-C following the consumption of a TFA diet . Invariably it was established that TFA could be worse than the SFA they were designed to replace in the first instance [1,3]. The Nurses Health Study  elucidated the effects of TFA using epidemiological data from 85.095 women, establishing an association between TFA and incidence of non-fatal myocardial infarction from coronary heart disease (CHD). A positive and significant association between trans and CHD was apparent. Foods that were major sources of trans including margarine and cookies also revealed a positive correlation. Relative risk for CVD was increased by 27% as a result of trans consumption . These studies clearly established an association of TFA consumption with increased incidence and death from CVD and it was estimated that almost 80,000 deaths in the United States alone were associated with continued consumption of foods rich in TFA. Recent studies have implicated TFA not only with CHD  but also with increased risk and incidence of diabetes . Dietary fat intake was evaluated for CHD risk  and type II diabetes in women. A 2% increase in TFA consumption relative to carbohydrate intake resulted in a relative risk score of 1.93 for CHD and 1.39 for type II diabetes. In comparison the score for SFA was significantly lower: 1.17 for CHD and 0.97 for type II diabetes. These findings served to highlight additional concerns about the safety of TFA in humans. Other concerns include adverse effects of TFA on cardiac arrhythmia and underlying implications for the developing fetus since TFA competes with essential fatty acids during fetal development. Based on these findings and a review of all available published literature relating to TFA, the Institute of Medicine (IOM) of the National Academies of Sciences, USA  declared that there are no data available to indicate a health benefit from consuming TFA and an Adequate Intake, Estimated Average Requirement, and Recommended Dietary Allowance are not established for TFA. Resulting from this expert recommendation and the mounting evidence against TFA, there is currently an urgent race to reformulate many solid fats TFA-free. 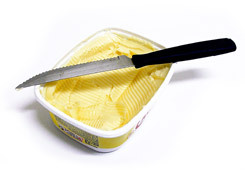 Hydrogenated fats are on their way out as a result of these developments and health concerns. The question that is paramount currently is how best to reformulate margarine, vanaspati, bakery, frying, and other solid fats such that these products are trans-free. Reformulated solid fats should not contain increased contents of SFA. A primary consideration in the food industry today is to count the sum of TFA and SFA as cholesterol elevating. A reformulated product at best must reflect significantly reduced amounts of this arithmetic sum if the stated goal of designing healthier solid fats is achievable. The choice now appears to be narrowed between natural semi-solid fats such as palm oil, cottonseed oil and / or TFA-free interesterified fats. Sterospecificity of most natural oils and fats favour placement of the polyunsaturates (PUFA) and monounsaturates (MUFA) in the sn-2 position whilst SFA are distributed in the sn1, 3 positions . An obvious attempt to use available liquid oils and hydrogenation capacities would be to fully hydrogenate the liquid oils into a hard stock. This would mean conversion of all the 18-carbon fatty acids (18:1, 18:2 and 18:3) in liquid oils to a stearic acid (18:0) block. Another common fat modification tool, interesterification, would then gain greater acceptance since it would allow fully hydrogenated vegetable oils to be randomized with the native vegetable oils to provide the required hard stock for solid fat formulations. This approach has great merit since currently stearic acid is considered a neutral fatty acid with respect to CHD risk. However this initiative may not be so straightforward since new concerns regarding the nutritional efficacy of strearic-rich interesterified hard stock could likely arise in the near future. Enzymatic interesterification of fats using enzyme technology allows placement of mostly SFA in the sn1, 3 positions of the triacylglycerol (TAG) molecule and unsaturated fatty acids in the sn2 position. Interesterification, the process increasingly being viewed as a viable alternate to hydrogenation (to produce higher melting fats) has the capacity to invert the fatty acid distribution and alter nutritional effects. Although such rearrangement of fatty acids within TAG has been postulated to result in beneficial effects for lipoprotein metabolism, the current evidence is rather divided . In palm oil, redistributing C16:0 in the sn-2 position has been reported to increase TC and LDL-C while other studies suggest no significant effects on these lipoproteins. In an atherogenic rabbit model, interesterified palm oil has been shown to be more atherogenic than its natural counterpart . A recent human study that compared a chemically interesterified-stearic-rich fat (IE), trans-rich hydrogenated fat and natural semi-solid fat showed that the physiologically important lipoprotein ratios (TC/HDL-C and LDL/HDL-C) and plasma glucose response in healthy subjects was adversely impacted by the IE and trans-rich fats compared to the natural semi solid fat (unpublished data, Sundram et al. 2005). These findings are suggestive in that the possible alternate to hydrogenated fats in the form of fully hydrogenated-interesterified fats are equally worrisome for lipoprotein metabolism, CHD and diabetic risks. These developments if proven correct, could force the food industry to re-think its current strategies for solid fat formulations. Deep-frying is an important food preparation / processing method practiced universally. For deep-frying purposes the oil or fat should have low PUFA especially, linolenic acid which tends to oxidize very rapidly. Commercial frying operations tend to use solid fats rather than liquid oils, primarily to minimize oxidation of the oils and to extend the shelf life of the fried products. Interestingly, very few of the unsaturated oils can be used for industrial frying. The common approach has been to partially hydrogenate liquid oils to eliminate their linoleic acid content and also reduce linoleic acid. Current preference is to choose newer varieties of high oleic oils and palm olein, which have been shown to be stable during industrial (continuous) frying operations. Another common alternative is to blend unsaturated vegetable oils with palm olein to reduce the overall linoleic acid content and confer stability to such blends . Shortenings, including bakery fats are used extensively in the food industry. Originally intended as a replacement for lard, partially hydrogenated fats became a mainstay in most shortening formulations. An important function of a shortening is its ability to incorporate and then hold air when beaten in a cake batter or creamed with sugar. The trapping of air facilitates the formation of a porous structure and increases volume of the cream and the baked product. Shortenings also contribute to lubrication and give the dough the required final consistency. Such properties cannot be imparted by native liquid oils, which lack the appropriate solids content . Palm oil is an exception since it is natural semi-solid fat. The quantity of palm oil incorporated into shortening generally varies from 30 – 40%. Currently many manufacturers are able to incorporate up to 80% of palm oil and its fractions in their shortening formulations. This is made possible because palm oil has 22-25% solids at 200C and it stabilizes the shortening and assists in good baking performance. A variety of trans-free cake shortenings are possible with palm-based products and these can be specially designed for very specific applications such as layer and pound cakes, sweet dough, breads and cream fillers. Palm based shortening are also excellent as pastry and bread fats . Margarine is defined as liquid or plastic emulsion containing not less than 80% fat, not more than 16% water and fortified with vitamin A. There are several types of margarine, each formulated to fulfil a specific requirement. Good physical properties necessary for quality margarine include emulsion stability without oil separation, no brittleness, good spread ability and a clean, smooth melt in the mouth. Margarine must be firm but spread able and these properties are related to the proportion of solid and liquid fat in the product at a given temperature. These requirements make it impossible for liquid oils in their native state to be incorporated in these formulations, unless a portion is also hydrogenated, giving rise to TFA. Margarine made significant progress at the expense of butter as the healthy alternate solid fat and a variety of PUFA margarines containing TFA were the norm until a decade ago. With increasing awareness about the detrimental effects of TFA [1-6], these TFA containing margarines are being phased out in favour of natural fat based formulations. In such products palm oil has become a favoured ingredient. Alternately, by suitably modifying natural semi-solid and solid fats through fractionation, interesterification or blending, it is possible to produce a variety of margarines that are TFA-free. Vegetable ghee or vanaspati is a major dietary fat source in many developing countries of the Middle East, Indian sub-continent, Afghanistan and South-East Asia. Differences in regional preferences of vanaspati are amplified by the texture of the product ranging from completely smooth to granular, depending on specific culinary practices. Vanaspati is usually produced with a range of fat blends, including a very high level of TFA containing hydrogenated fats. While the developed world is gearing itself to eliminate TFA from its diet, vanaspati remains a major contributor of TFA in these countries and realization of the underlying health implications of TFA among health authorities in these countries is very poor. Any effort to reduce TFA in these products will entail the incorporation of palm oil as a base ingredient. It is also possible to produce vanaspati using 100% palm oil and such a product has been found to be highly acceptable in many West Asian countries . Nevertheless, a number of formulations using blends of palm and soft oils have been tested for vanaspati applications with promising results in terms of consumer acceptance and reduced TFA content. Do Fat Reformulation Efforts Serve Both Functionality and Health? As indicated earlier, reformulated TFA fats must be proven to be healthier (primarily less cholesterol-raising) than the TFA-rich fats they are designed to replace. Such replacement would preferentially entail the use of natural fats, which are also rich in SFA. The answer may lie in the American Heart Association’s (AHA) Step-1 diet which advocates equal balancing of SFA, MUFA and PUFA in a 30% fat energy diet. This primarily pursues the goal of reducing overall fat consumption, which in turn is postulated to trigger reductions in plasma lipid-lipoprotein associated CHD risk factors. None of the current commercial oils and fats on their own are able to meet this specified fatty acid distribution. Sundram et al. designed an AHA oil blend incorporating soyabean, Canola and palm oils which resulted in a 1:1:1 ratio of the SFA, MUFA and PUFA while being TFA-free. This was tested in healthy normocholesterolaemic volunteers who were fed carefully designed whole food diets and compared against Canola oil (18:1-rich), palm olein (16:0-rich) or the AHA Step-1 diet, all contributing approximately 31% fat energy and < 200mgdietary cholesterol/day. Plasma TC and LDL-C were not significantly affected by these three diets despite manipulations of the key dietary fatty acids. The high 18:1 Canola and high 16:0 palm olein resulted in almost identical plasma and lipoprotein cholesterol levels. Only HDL-C after the AHA diet was significantly raised compared to the other two diets. The findings of the above study have now become the subject of a patent  advocating a balanced fatty acid ratio incorporating palm oil, for maintaining an improved LDL/HDL-cholesterol ratio that could be cardio-protective. The patent findings have been commercialized as a range of TFA-free healthful margarine and solid fats and serve as a primary example how the food industry can provide functionality and health in a TFA-free environment. 1. Institute of Medicine (IOM). Letter report on dietary reference intakes for trans fatty acids. In: Dietary reference intakes for energy, carbohydrate, fiber, fat, fatty acids, cholesterol, protein and amino acids. Institute of Medicine/Food and Nutrition Board. Washington, DC: National Academy Press, 2002. Internet:http://www.iom.edu/fnb (accessed 10 Oct 2002). 2. Mensink RP, Katan MB. Effect of dietary trans fatty acids on high-density and low-density lipoprotein cholesterol levels in healthy subjects. N Engl J Med 1990; 323: 439-445. 3. Sundram K, Anisah I, Hayes KC, Jeyamalar R, Pathmanathan R. Trans (elaidic) fatty acids adversely impact lipoprotein profiles relative to specific saturated fatty acids in humans. J Nutr 1997; 127: 514S-520S. 4. Willett WC, Stampfer MJ, Manson JE, Colditz GA, Speizer FE, Rosner BA, Sampson LA, Hennekens CH. Intake of trans fatty acids and risk of coronary heart disease among women. Lancet 1993; 341: 581-585. 5. Ascherio A, Hennekens CH, Buring JE, Master C, Stampfer MJ, Willett WC. Trans fatty acid intake and risk of myocardial infarction. Circulation 1994; 89: 94-101. 6. Hu FB, St ampfer MJ, Manson JE, Rimm E, Colditz GA, Rosner BA, Hennekens CH, Willett WC. Dietary fat intake and risk of coronary heart disease in women. N Engl J Med 1997; 337: 1491-1499. 7. Salmeron J, Hu FB, Manson JE, Stampfer MJ, Colditz GA, Rimm EB, Willett WC. Dietary fat intake and risk of type 2 diabetes in women. Am J Clin Nutr 2001; 73:1019-26. 8. Hunter JE. Studies on effects of dietary fatty acids as related to their position on triglycerides. Lipids 2001; 36: 655-668. 9. Kubow S. The influence of positional distribution of fatty acids in native, interesterified and structure-specific lipids on lipoprotein metabolism and atherogenesis. J Nutr Biochem 1996; 7: 530-541. 10. Hayes KC. Synthetic and modified glycerides: effects on plasma lipids. Curr Opin Lipidol 2001; 12: 55-60. 11. Nor Aini I, Suria MSA. Food uses of palm and palm kernel oils. In (ed. Basiron Y, Jalani BS, Chan KW). Advances In Oil Palm Research Malaysian Palm Oil Board, Kuala Lumpur, Malaysia. p 968-1035. 2000. 12. Sambanthamurthi R, Sundram K, Tan YA. Chemistry and biochemistry of palm oil. Progress in Lipid Research 2000; 507-558. 13. Sundram K, Hayes KC, Siru OH. Both dietary 18:2 and 16:0 may be required to improve the serum LDL/HDL cholesterol ratio in normocholesterolemic men. J Nutr Biochem 1995; 4: 179-187. 14. Sundram, K., Perlman D, Hayes, KC. Increasing the HDL level and HDL/LDL ratio in humans with fat blends. United States of American Patent No. 557 8334, 1996.